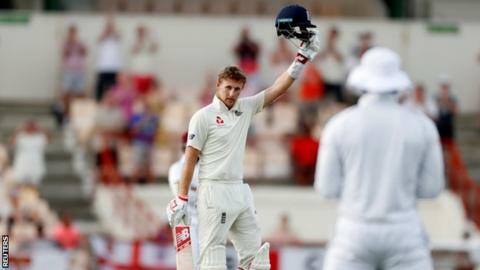 Captain Joe Root set up England’s push for victory with an unbeaten century on day three of the third Test against West Indies in St Lucia. Root has struggled in the series but dug in to make 111 not out and see his side close on 325-4, a lead of 448. The tourists batted throughout the day with Joe Denly making 69 – his maiden Test fifty – and Jos Buttler 56. England will now likely declare on day four and attempt to bowl out West Indies to earn a consolation victory. When West Indies do bat again they will either need to complete a record fourth-innings run-chase to win the match or bat out what remains of the final two days for a draw. Root’s side dominated the third day, having resumed on 19-0, but there were further failures for openers Rory Burns and Keaton Jennings. Burns fell to the first ball of the day for 10 while Jennings was bowled by Alzarri Joseph for a scratchy 23. 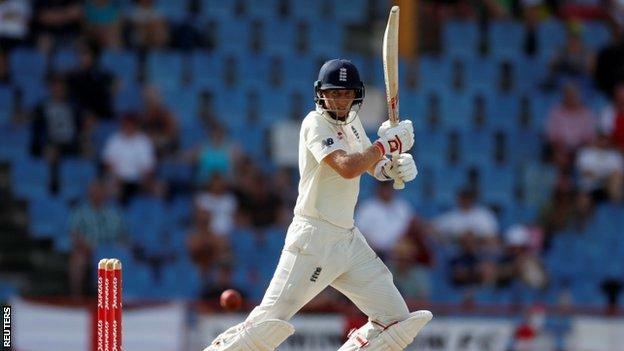 Despite being England’s premier batsman, Root had been unable to prevent his side falling to heavy defeats in the first two Tests as West Indies clinched the series with a game to spare. He had scored just 55 runs in the previous five innings with a high score of 22 and had not scored a half-century in seven innings – the joint-worst run of his career. In this innings, Root batted conservatively to begin with, frequently nudging the ball into the leg side, before picking up the pace to bring up his 16th Test hundred in 189 balls with his ninth four. He celebrated in an understated manner and when he punched the air there seemed to be a tinge of frustration that the runs had not come when the series was alive. Root came to the crease at 73-2 after both openers were dismissed but combined well with Denly in a partnership of 74. Denly, playing in his second Test, batted more positively than his captain with a number of fine drives through the off side and looked to be set for a big score until he under-edged a cut off Shannon Gabriel to the wicketkeeper. While the Kent batsman impressed he was reprieved on 12 when Shimron Hetmyer dropped a regulation catch at first slip and his score is unlikely to be enough to fully secure his place at number three in the Ashes series next summer. After Denly was dismissed, Root shared a century stand with Buttler, until the England vice captain was bowled by an excellent delivery by Kemar Roach, and ended the day along side Ben Stokes, who made an unbeaten 29. Root’s innings helped England pass 300 for the first time in the series and they are now heavy favourites to win what is their final Test match until 24 July. 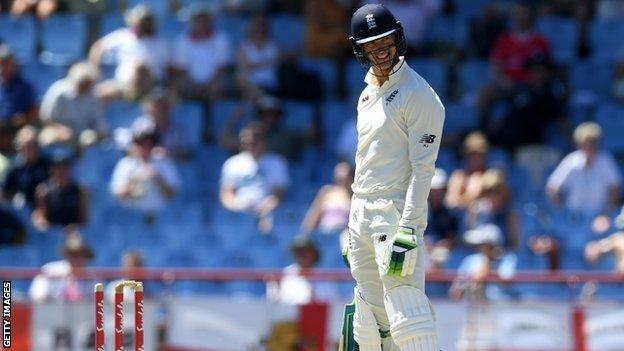 While England’s showing in St Lucia looks likely to give them momentum going into the summer, issues remain. Once again opener Jennings was out for a disappointing score to a quick bowler, although on this occasion he was unlucky to be bowled off his thigh pad by a loose delivery from Joseph. Jennings struggled to score during his knock with his 23 coming from 99 deliveries at a strike-rate of 23.23. His fellow opener Burns fell in tame fashion at the start of the day when he clipped a leg-stump half-volley straight to square leg. It looks unlikely that Jennings will feature in the first Ashes Test next summer but former England captain Michael Vaughan expects Burns to remain in the team. “England have to find someone who understands what opening the batting is like and he has been opening the batting for Surrey for many years,” Vaughan said on The Cricket Social. “I expect him to get a run of games but you would want him to average more runs. England were also helped on day three by West Indies who seemed to lack intensity with the series already won and suffered a number of injuries. Within the first 20 minutes of the day all-rounder Keemo Paul was stretchered off the field with a thigh strain which restricted the hosts’ bowling options while Darren Bravo also spent the day off the field with a hand injury. England did not increase their attacking intent late in the day with no suggestion that Root would declare and make West Indies face a tricky spell with the new ball. At the close the England captain suggested they could even bat longer into day four. “We’ll have a think about the declaration tonight, see how it plays after the roller and make a decision early on,” Root told Sky Sports. Former England captain Alastair Cook was not surprised by the decision to bat through day three. “There are still two days left in this game. Why wouldn’t you want the extra cushion [of more runs],” Cook told the Test Match Special Podcast. “The players are in it to play games of cricket, they are not in it to make it exciting at certain times. “If England get a 500 lead they will be more comfortable bowling.